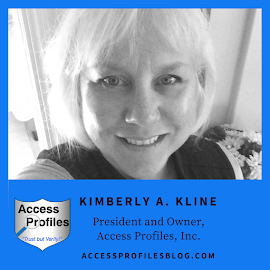 Access Profiles, Inc.: Ready to Improve Your Brand? Why You Need Think Before Clicking "Like"! Ready to Improve Your Brand? 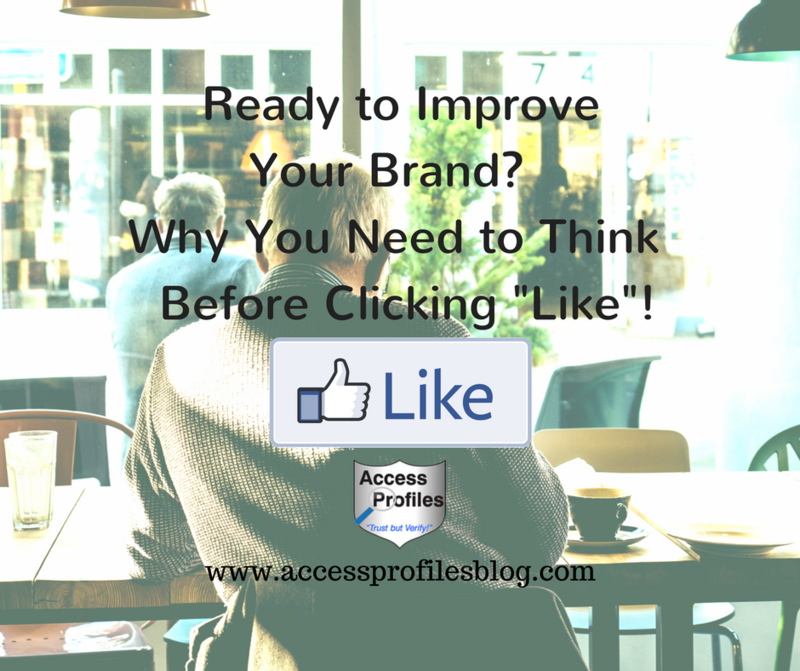 Why You Need Think Before Clicking "Like"! How Careful are You when Using Social Media? or any other social network? 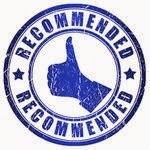 Do you simply see a cute photo, funny story, interesting post, or great product and give it the “thumbs up”? I would venture to say that many do just that. Even if we pause for a moment, it is simply too easy to press the “like” button for something that makes us smile, think a little, or catches our eye. However, this may not be the best tack to take. Your “like” may actually reveal more about you than you think. And now that Facebook has added the "love", "haha", "wow", "sad", and "angry" options, it is more revealing than ever! In most cases, your "like" is not an obvious statement, such as when you "like" a certain political or social page, but a pattern of “likes” that allow others to “infer attributes such as intelligence, sexual orientation, or political views that an individual may not have intended to share”. Many times these are things about ourselves that we may not even be aware we are sharing. And recent issues with Facebook and our elections shows that companies and candidates are watching!! Do You Know what a Facebook "Like" Says about You? "Tweet This"
In reality, your “like” may even be seen as an endorsement. When you click “like” on a product or business page, it is assumed that you have a connection with that company. People may think you have used their product or service and, unless you state otherwise, are happy with it. Companies are also counting on the fact that when you “like” a product or service on Facebook, that “like” will now be seen by your friends. The result? Instant advertising and product endorsement. And the power of a Facebook "like" doesn't stop there. Even the courts are getting in on the act. A case concerning Facebook "likes" came out of the Virginia circuit court. It involved police department employees and their “like” of a rival Sheriff candidate’s Facebook page. The current sheriff objected and instituted disciplinary actions against the department employees. In turn, they filed a lawsuit against the sheriff. The court ruled that Facebook "likes" are protected as free speech. Therefore, the sheriff could not legally take any actions against the department employees for liking the page or posts of the rival sheriff. However, the court also stated that “liking a political candidate's campaign page communicates the user's approval of the candidate and supports the campaign by associating the user with it”. in this case of a candidate. It stands to reason then that this approval may be inferred about any other post you “like”. As you can see, whether you mean to or not, Facebook “likes” can present a picture of who you are and what you think. Some things, like causes you believe in, you may want to share. While other things, like your politics, you may not. While this may not mean much if you simply use Facebook to connect with friends, for those of you cultivating an online business presence, this can be more problematic. yourself and your customers takes time. But it can take very little to lose it. You may find that certain “likes” actually alienate potential clients, or attract interest you never intended. For this reason, I try to avoid “liking” political, religious, or possibly controversial posts. My goal is to project an image in line with my core company beliefs, and I try not to “like” anything that may derail that goal. That is not to say that I don’t want to let my connections know “me”. It simply means I try to be careful in how I accomplish that. Learn more about mixing your business and personal life and views ~ and why sometimes it makes sense in "Are You Ever Smart to Mix Your Personal Beliefs with Your Business?". And if you are in the market to for new job or even a promotion, your online image has weight ~ and that includes what you "like" and share. Employers will look. Projecting the most professional image possible goes a long way. 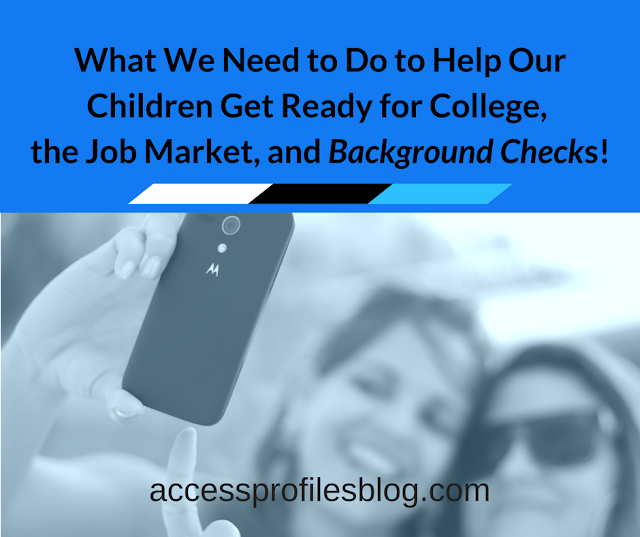 "Social network posts, comments, and pictures by either you or others may reveal information about you that you might not want a potential employer to know. The truth is, employers often use whatever information they can obtain to help them make a hiring decision. It is important that you know what information can be seen by those not even in “your circle” and to think about what kind of conclusions might be drawn from it." Excerpt from; "Social Media, Background Checks, and Company Policy". may not be as innocent as it seems. However, being aware of that is more than half the battle. Keep that in mind and you can enjoy the wonderful connections and fun that “liking”, sharing, and commenting on posts can bring. Please Share and "Like" this post! API can Help You or Your Company Navigate the world of Background Checks, Hiring, and running your Business! Discover more About Us and get answers to Your Questions too! Source 1: "Private Traits and Attributes are Predictable fromDigital Records of Human Behavior"